John Bry asked GRDC Executive Director Sherita Smith how he could get involved in the Grandmont Rosedale community before he moved into his home in Grandmont #1 last year. John also reached out the Grandmont #1 Improvement Association to introduce himself and to ask them how he might pitch in. Clearly John was familiar with the importance of resident involvement in creating community. You could say that creating community is what John does for a living. As Principal Planner Program Coordinator at Main Street Oakland County, John works daily to discover the many elements that are involved in creating a stable, desirable community. When John moved to Michigan to take the job with Oakland County, he simply moved into an apartment close to work. When he was ready to find a home, though, he did some research. A co-worker suggested he take a look at Grandmont Rosedale as it is known as “one of the stronger neighborhoods in the city,” so John took a look. It was pretty much love at first sight: “I fell in love with the history and architecture of the homes.” For weeks John drove through Grandmont Rosedale, looking at the beautiful homes, hoping to find one for himself. When he wasn’t house hunting, John researched several of the homes, learning about architects, the families who lived in the neighborhood, and even where former residents were now. John has a lifelong love for older homes, and research. In fact, John got his Master’s degree in Planning and Historic Preservation with an emphasis on restoration in neighborhoods and downtowns. John’s skill as a researcher has turned up some pretty interesting information. John’s 1928 home in Grandmont #1 was once the home of a dentist and OB/GYN who were originally from Canada. This husband-wife team of doctors had their offices in the Fisher Building and moved to Boston Edison after living in Grandmont #1 for 14 years. The couple has since died and are buried in Canada. John research tools include census records, building permits, birth and death records, and of course, stories from neighbors. This interest in people, homes, and neighborhoods began when John was a kid growing up on a farm in northeast Indiana. In fact, one of his most exciting discoveries happening when he was just 13, and working on a 4-H civics project. As a young teen, John started researching his hometown, Auburn, in northeast Indiana. John found out that in the late 1920s – 1930s, his town manufactured the very high end Duesenberg automobiles, which was pretty exciting. Then, from photos his grandmother showed him, John learned about a monument company in Auburn that was once owned by John’s ancestors. 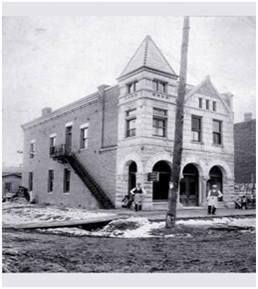 The photo showed a beautiful building built in 1903 with four grand stone arches. John set out to the Dekalb County historian to find out more. He asked the historian if there was any more information about the building. The historian told John that the arches were in fact around, lying around actually, in the weeds at the city storage yard. John wasted no time and found, back by the oil drums and pipes, he found “an owl’s face in limestone, staring up at me.” John hacked back the weeds, revealing the gorgeous arches. 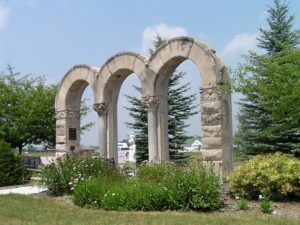 The city of Auburn was so pleased with John’s research, effort, and spectacular find, they installed the arches as a free standing monument in a garden at a senior center. It’s not uncommon to see people gathering under the arches to be married, or just to have their photo taken under the beautiful arches. The arches had been lying in the weeds for over 20 years and now they stand as a reminder of the town’s history and of one 13 year old boy’s love for history, architecture, and his home town. PreviousPrevious post:The Well-Attended February Neighborhood Safety Meeting Draws Residents from Grandmont Rosedale and BeyondNextNext post:GRDC is Hiring!